Own an iPad and do a whole lot of traveling on the road? Well, we do know that the iPad (as well as the iPad 2) sports some pretty legendary battery life, but that doesn’t mean it is able to go on forever. No sir, even these magical tablets need some juice once in a while, and this is where the Griffin Powerjolt Micro for iPad comes in. Most of us use the cigarette lighter port in the car for something else, and plugging in a charger is more often than not the main purpose. The same applies for this nifty little gizmo, where it will turn the same cigarette lighter outlet into a more useful USB port, which carries enough voltage to charge your iPad, iPhone and iPod. Oh yeah, before you think that this is some Apple-centric blog, fret not as it can also handle other USB-compatible devices as well. 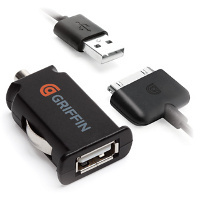 With the Griffin Powerjolt Micro for iPad in your car, you can be sure that you will never have to stop your Angry Birds session simply because your iPad is out of juice – as long as you are willing to invest £17.99 in this puppy.